I’ve just come across an article written by Fintan O’Toole for the Irish Times where he posits that Trial runs for fascism are in full flow. Now I’m sure Mr O’Toole is probably far better informed than me and has spent far more time than me considering such matters. He certainly carries on the narrative popular amongst the left that the sky is falling and that any day now there’ll be jack boots kicking in doors. From pretty much everything Trump does to the Brexit vote is all part of a global plan to quietly usher in a new Fascist regime. Now I continue to struggle to believe in such global conspiracies if only because I doubt that our glorious leaders could organise a piss up in a brewery. However if you give his idea of a global Fascist conspiracy credence then I think he’s missing half the picture, if we are seeing the quiet trialling of a fascist take over then I’d suggest we’re seeing the Harkonnen ploy. Put such terrible people in charge, have them grind people down so much that when a “strong” leader arrives to “liberate” us then we’ll welcome them with open arms and give them all the powers they ask for, place our necks under their honeyed boot. Now some of you will possibly be saying I’m being fanciful and contrary just because someone on the left has written something. To rebut such accusations let me play an alternative movie reel for you – in the same genre as Mr O’Tooles dystopia. What if the Brexit vote wasn’t manipulated but just the appearance of manipulation was created. This appearance of manipulation could then be used to water down and ignore a huge democratic vote. To trial how blatantly a democratic movement could be ignored without causing riots, to see how little theatre is needed to be able to ignore vast swathes of the people, to find out just how crushed peoples spirits are. The division of the population into tribal factions is definitely happening, but look at which side is declaring certain view points beyond the pale, and that just holding some opinions merits ostracism and violence. It’s not those Mr O’Toole has in the frame. Of course if there was a global conspiracy to bring about fascism they’d no doubt be using both sides as it doesn’t matter who carries out there work, especially if it’s a bait and switch. As Mr O’Toole says it doesn’t need a majority just enough people that are prepared to use intimidation, at which point I look at Antifa and their habit of turning up to peaceful events masked and almost in uniform to make sure that those events aren’t peaceful. To see who’s using intimidation to suppress opinion and freedom of association we need to point the camera in the opposite direction to where Mr O’Toole would have us look. We’re seeing that tricky step of people getting used to extreme cruelty and violence with the readiness that people took to “punch a Nazi”. Which rapidly became “punch anyone that looks a bit like a Nazi” and then “punch anyone we disagree with”. Which groups are being dehumanised and widely portrayed as a threat, depends on which reel you’re watching from the one side it’s numerous protected minorities particularly those of certain faith which cannot be criticised, from the other side the threat is the racist proles that votes for Brexit, like the football and are starting to become interested in politics. Mr O’Toole does miss a couple of elements that one should expect to see, and again I suggest that’s because his camera is pointing the wrong way. There should be the take over of a legitimate party by entryists and extremists that demand the purging of the party for political purity – I’m looking at you momentum. There should be a cult of personality around a political leader, who is seen as above criticism and the saviour in waiting – step forward Mr Corbyn and your fan club. For the full cliché of course what you’d really need is a left-wing political party with a strong anti-Semitic tendency, yep got that as well though again not where Mr O’Toole is looking. If you want to buy the script that Mr O’Toole is selling, that we’re seeing a global conspiracy to run sea trials of fascism then I’d like to suggest he’s not showing you the whole picture. That if that is what’s really going on then it’s not one side or the other of the political fence that’s the problem but the whole of the political establishment. 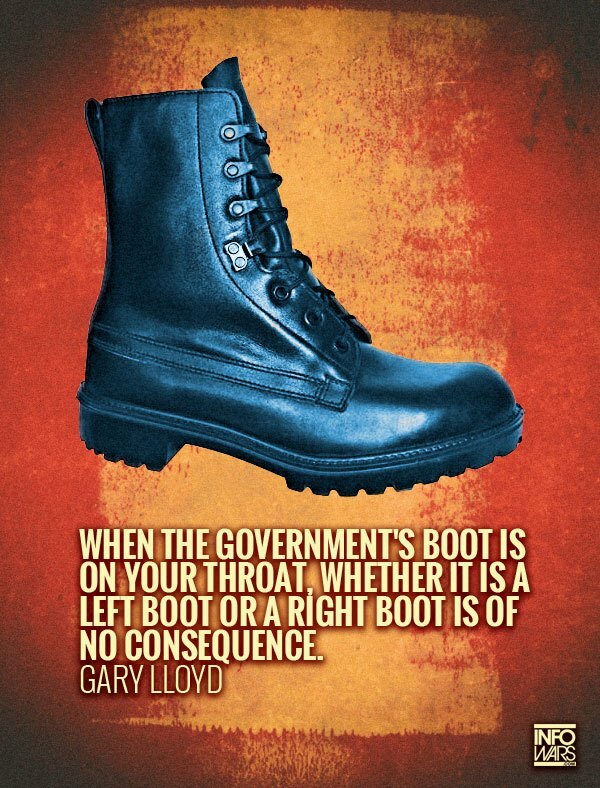 I would though suggest that when the violence arises to save us, the jack boots will once again be worn by those on the left. So which movie are you watching? Or should we perhaps consider that if this plot is accurate that the trials are being from both sides because ultimately they all just want to be the one wearing the boot stamping on our face. Tagged Antifa, brexit, Civil Liberties, Conspiracy, corruption, freedom, politicians, politics, tin foil hat time. Bookmark the permalink.